how-to-order-wire-mesh-trays | Welcome to Hillside Wire Cloth Co.
Hillside Wire Cloth is a leading provider of Wire Mesh Products. Our product line spans over a dozen Wire Mesh Product families which include over 500 individual Wire Mesh Products. Our Wire Mesh Products are available in practically every conceivable specification of Mesh Size and Wire Diameter to match your particular application. Our Wire Mesh comes in Woven and Welded, and is available in numerous materials including Stainless Steel, Steel, Galvanized, Bronze, Monel, Nickel, Copper, and Brass to name a few. 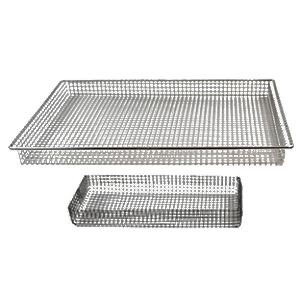 Please enter the specifications you require for your Custom Wire Mesh Trays. You may use this form over again for a additional Custom Wire Mesh Tray Design quotes. Our sales team will contact you directly to confirm your design specifications and thoroughly examine your requirements. Have exact Specifications in a File? Please be sure to use the comments section below to tell use more about your design requirements. We'll contact you shortly to discuss the design personally to ensure we match your exact specifications perfectly.